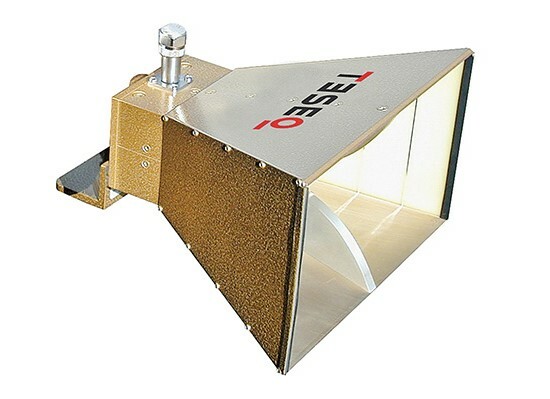 The Teseq’s BHA 9118 is a linearly polarised broadband antenna with frequency range of 1 to 18 GHz. The antennas are ideal for many applications particularly EMC/RF measurements. It can be used for both receiving and transmitting. A precision ‘N’ connector is used to provide low VSWR and high power handling capability. The mounting bracket allows easy adjustment for vertical, horizontal and 45 deg polarisations, and has a standard camera thread (1/4” X 20) hole that allows fitting to support structures including all Teseq tripods. The precision design is rugged and corrosion resistant. However, as with any precision instrument, care should be taken when using the BHA 9118. A protective strip protects the two fiberglass sides from accidental damage.